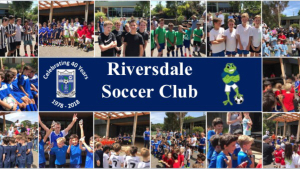 Riversdale is a community-based club, located in Camberwell, Victoria, with a range of senior and junior teams. Our goal is to provide an environment for players to enjoy participation in a team sport, learn to play football and be supported to develop and achieve their potential. Our men’s teams compete in the State League 4 East and also in the Sunday Thirds League. Our juniors begin in the FFA MiniRoos (formerly called "Small Sided Football" (SSF)) program, and then progress from Under 12s through to Under 18s. Riversdale SC.....a community that loves the game! The 2019 Riversdale MiniRoos Program promises to be the best value football program for kids aged 6 - 12 in Victoria, if not Australia. The program kicks off week beginning 4/2/19 at the following locations and times. Please note, the initial 3 weeks will involve an administrative overhead, where all players are required to register their attendance at training. The training sessions will last 1 hour, however, due to the administrative overhead, we have set down an additional 30 minutes for administration and overrun. First home game of the season for the Dales! Come down and support the boys from the Hollow!! 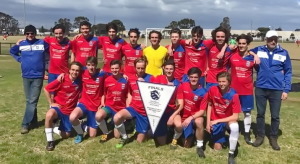 Riversdale SC - 2017 Metropolitan 17A champions: Click here for full story.